OK… this will probably open up more than one can of worms. The wife and I hardly considered ourselves patriotic. And white is not always our favourite choice of colour. But we loved Singapore enough and have never wanted to live anywhere else. However, the Singapore and Singaporeans that we have came to know for the past 40 or so years have, in recent years, morphed into something really different. Maybe it is the generation divide, or perhaps this is what happens when a country is struggling to find the right balance between protecting the interests of its citizens and continue to embrace foreign migrants/investors. For the record, both the wife and I were born, raised and educated in Singapore (ok, the wife spent a couple of years overseas for her Uni studies). We both work for a living, have a child that attends local primary school, live in a modest apartment and do take public transportations although we own cars. And just like many Singaporeans, we fully subscribed to the "Singaporeans first" call. Thus we firmly believed that Government policies should be tailored towards safeguarding the interests of Singaporeans first, whether be it in education, health or housing. However, we are getting somewhat uneasy as more of such calls are being laced with nationalistic overtones these days. Yes, Singaporeans are primarily the ones that serve National Service and pay taxes. Some may go further to say that Singaporeans are the ones that ultimately decide who should be in power to govern our Country. And yes, we have had our fair share of badly behaved foreigners when they are guests of our Country. But does being Singaporean also give us the prerogative to outright discriminate against foreigners? It is probably acceptable to say (for example) that foreigners should be taxed at a higher rate when purchasing private properties in Singapore. But it is quite the other to advocate (again for example) banning foreigners from buying Singapore properties altogether, irrespective of whether the said property is public housing or private home. 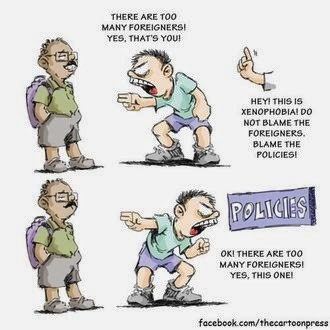 Some may argue that we DO welcome foreigners albeit selectively. Sure, foreigners are welcomed to come take care of our kids & old folks at home, clear our tables at food courts, tend to our sick at hospitals and build our HDB & condos. But do not come with your money to snap up all our condominiums and inflate our property prices. So what if those multi-million dollars luxury apartments are not the staple housing for most of our locals in the first place? If not because of all them foreign buyers, prices of apartments from Sentosa Cove to Holland Road will probably still be less than $1,000psf today! Sure, foreigners are welcomed to visit our Country and spend your tourist $ so that the business I own/the company I work for will continue to profit from your money enough for me to remain in business/keep my job. But do not buy what you cannot take home with you. More importantly, do not stay here for too long to crowd our streets, jam our MRT trains, compete for those white-collar jobs that we want to do and take our women (else they will have little choice but to stick to local men, regardless of the fact that we are no longer living in the Stone Age). Ok, the wife and I are starting to rant and we probably should stop before being branded as “pro foreigners” (again). But as our nation turns 49 this coming August 9, the wife and I cannot help but wonder if we have indeed progress as a nation apart from the modern sky-scrappers and monstrous shopping malls. 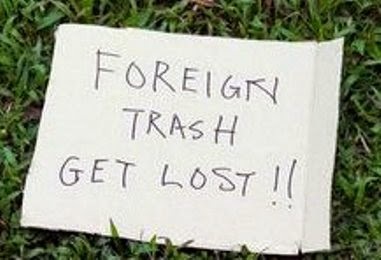 If a nation's progress is measured by the level of xenophobia within its society, then Singapore has definitely come of age over the last few years. We can choose to blame it all on Government policies (or even greedy developers), but unless one is mentally unsound, he is master of his own words and deeds. That is what makes us human. P/S: Despite what's been said, the wife and I remained hopeful that the majority of our fellow Singaporeans will continue to subscribe to the notion of "Singaporean First" rather than the later. 1 comment to ''Singaporeans FIRST or Singaporeans ONLY..?" Thanks for the lunch time read. Interesting commentary but I guess to each his own. We can't do without them (foreigners) and we can't do with them either. Its a fine balance. Hate to link to another article outside of your domain but this probably adds to the debate http://therealsingapore.com/content/new-citizens-get-priority-ndp-tickets-while-sporeans-are-rejected-over-10-years ... Look at the article and the comments made. Sad to see my fellow Singaporeans react that way.